Chief Petitioners: Senator Ginny Burdick (D-Portland), Multnomah County Sheriff Dan Noelle, and Jackson County Sheriff Robert O. Kennedy. 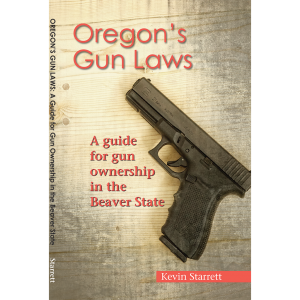 (3) It is in the best interests of the people of Oregon that any person who transfers a firearm at any location other than a gun show be allowed to voluntarily request a criminal background check before completing the transfer of the firearm. SECTION 2. Sections 1 to 8 of this 2000 Act and the amendments to ORS 166.416, 166.418 and 166.460 by sections 9, 10 and 11 of this 2000 Act shall be known as the Gun Violence Prevention Act. (a) “Gun dealer” has the meaning given that term in ORS 166.412. (b) “Gun show” means an event at which more than 25 firearms are on site and available for transfer. SECTION 4. Sections 5 to 8 of this 2000 Act are added to and made a part of ORS 166.410 to 166.470. SECTION 5. (1) Notwithstanding the fact that ORS 166.412 requires a gun dealer to request a criminal history record check only when transferring a handgun, a gun dealer shall comply with the requirements of ORS 166.412 before transferring any firearm to a purchaser. The provisions of ORS 166.412 apply to the transfer of firearms other than handguns to the same extent that they apply to the transfer of handguns. (2) In addition to the determination required by ORS 166.412 (3)(a)(A), in conducting a criminal background check or criminal history record check, the Department of State Police shall also determine whether the recipient is otherwise prohibited by state or federal law from possessing a firearm. (3) Notwithstanding ORS 166.412 (5), the department is not required to operate the telephone number established under ORS 166.412 (5) on Thanksgiving Day or Christmas Day. (4)(a) The department may charge a fee, not to exceed the amount authorized under ORS 166.414, for criminal background checks required under this section or section 6 of this 2000 Act. (b) The department shall establish a reduced fee for subsequent criminal background checks on the same recipient that are performed during the same day between the hours of 8 a.m. and 10 p.m. SECTION 6. (1) The Department of State Police shall make the telephone number established under ORS 166.412 (5) available for requests from persons other than gun dealers for criminal background checks under this section. (f) The type, issuer and identification number of a current piece of identification bearing a recent photograph of the recipient presented by the recipient. The identification presented by the recipient must meet the requirements of ORS 166.412 (4)(a). (5)(a) The department may retain a record of the information obtained during a request for a criminal background check under this section for the period of time provided in ORS 166.412 (7). (7)(a) Except as otherwise provided in paragraphs (b) and (c) of this subsection, a transferor who receives notification under this section that the recipient is qualified to complete the transfer of a firearm is immune from civil liability for any use of the firearm from the time of the transfer unless the transferor knows, or reasonably should know, that the recipient is likely to commit an unlawful act involving the firearm. (b) If the transferor is required to request a criminal background check under section 7 of this 2000 Act, the immunity provided by paragraph (a) of this subsection applies only if, in addition to receiving the notification required by this section, the transferor has the recipient fill out the form required by section 7 (1)(a) of this 2000 Act and retains the form as required by section 7 (2) of this 2000 Act. (B) In any product liability civil action under ORS 30.900 to 30.920. (b) Completes the transfer through a gun dealer. (2) The transferor shall retain the completed form referred to in subsection (1) of this section for at least five years and shall make the completed form available to law enforcement agencies for the purpose of criminal investigations. (3) A person who organizes a gun show shall post in a prominent place at the gun show a notice explaining the requirements of subsections (1) and (2) of this section. The person shall provide the form required by subsection (1) of this section to any person transferring a firearm at the gun show. (4) Subsection (1) of this section does not apply if the transferee is licensed as a dealer under 18 U.S.C. 923. (5)(a) Failure to comply with the requirements of subsection (1), (2) or (3) of Ethis section is a Class A misdemeanor. (b) Notwithstanding paragraph (a) of this subsection, failure to comply with the requirements of subsection (1), (2) or (3) of this section is a Class C felony if the person has two or more previous convictions under this section. (6) It is an affirmative defense to a charge of violating subsection (1) or (3) of this section that the person did not know, or reasonably could not know, that more than 25 firearms were at the site and available for transfer. SECTION 8. (1) The Department of State Police shall develop a form to be completed by a person seeking to obtain a firearm at a gun show from a transferor other than a gun dealer. The department shall consider including in the form all of the requirements for disclosure of information that are required by federal law for over-the-counter firearms transactions. (2) The department shall make the form available to the public at no cost. SECTION 9. ORS 166.416 is amended to read: 166.416 (1) A person commits the crime of providing false information in connection with a transfer of a [handgun] firearm if the person knowingly provides a false name or false information or presents false identification in connection with a purchase or transfer of a [handgun under ORS 166.412] firearm. (2) Providing false information in connection with a transfer of a [handgun] firearm is a Class A misdemeanor. SECTION 10. ORS 166.418 is amended to read: 166.418. (1) A person commits the crime of improperly transferring a [handgun] firearm if the person is a gun dealer as defined in ORS 166.412 and sells, leases or otherwise transfers a [handgun] firearm and intentionally violates ORS 166.412 or section 5 of this 2000 Act. (2) Improperly transferring a [handgun] firearm is a Class A misdemeanor. SECTION 11. ORS 166.460 is amended to read: 166.460. (1) ORS 166.250, 166.260, 166.280, 166.291 to 166.295, 166.410, 166.412, 166.425 and 166.450 and sections 5 and 7 of this 2000 Act do not apply to antique firearms. (2) Notwithstanding the provisions of subsection (1) of this section, possession of an antique firearm by a person described in ORS 166.250 (1)(c)(B), (C) or (D) constitutes a violation of ORS 166.250. NOTE: Matter in boldfaced type in an amended section is new; matter [italic and bracketed] is existing law to be omitted. New sections are in boldfaced type.